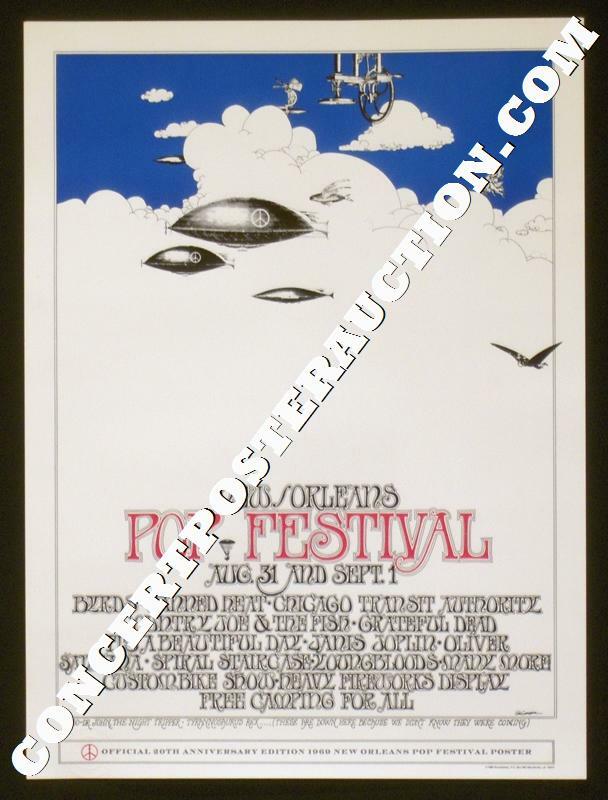 Official 20th Anniversary commemorative 2nd printing 18&1/2 x 25" concert poster for the "New Orleans Pop Festival" held at the Baton Rouge International Speedway in Prairieville, LA on 8/31-9/1/1969. The event featured performances by Jefferson Airplane (not listed), Santana, Chicago Transit Authority, Grateful Dead, the Byrds, Dr. John the Night Tripper, Country Joe & the Fish, Janis Joplin, Oliver, the Youngbloods, Canned Heat, Tyrannosaurus Rex and It's A Beautiful Day. Design by Stephen St. Germain, medium-thin semi-gloss stock poster is in fantastic near mint (A-) condition; just a trace of handling wear, otherwise fine. Great-looking regional festival poster with an awesome lineup.